Want a unique drinking glass - then try the custom mason jar! A classic and fun promotional item with you custom logo. 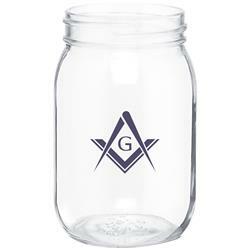 Clear 16 oz mason jar with a threaded top (Lid available - see mason jar lid options below) and your custom logo. Corn cob pipe sold seperately (kidding). Made in USA! FREE RUSH AVAILABLE! Production Times Available: 5 working days. RUSH AVAILABLE! Dimensions: 16 oz. 5 1/8 inch high. Color Print - one sided, two sided, or wrap imprint. 16 oz clear glass mason jar. 7 pounds per 12 pieces.